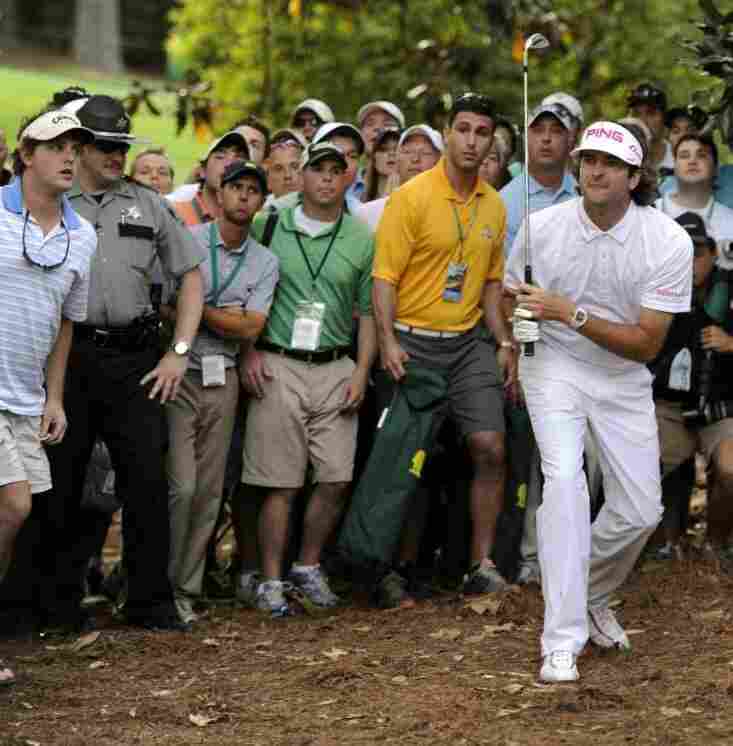 Bubba Watson hitting the hook that effectively won the Masters Tournament. Hours and hours of hitting little plastic golf balls and learning to make them twist and turn and bend and bounce in almost any direction. That's one reason why golfer Bubba Watson was able to hit a shot Sunday that most duffers could never make — and do it to win this year's Masters Tournament. Watson, according to Golf World editor-in-chief Jaime Diaz, "sees connections where other people don't see connections. ... He solves problems in a more unique and complex way." The 33-year-old golfer from Florida, as Diaz has previously reported and as Watson himself believes, almost surely has attention-deficit disorder. "Those really creative, different, unique shots are the product of ADD," Diaz told All Things Considered co-host Robert Siegel earlier this afternoon. As you've likely heard by now, Watson's recovery from trouble — his tee shot flew to the right of the fairway on that second playoff hole and ended up atop a bed of pine needles under some trees — was one of the most remarkable golf shots of recent years. Watson following the path of his shot. The swing Watson used, Diaz said, had an "inside-out-path" that produced the hook (his backswing was "inside" a theoretical straight line through the ball, while his return swing went to the outside of that line). At the bottom of the swing, Watson was able to "rotate his hands in a way he's not thinking about," to add more direction to the ball's flight, Diaz said. And it was all happening with "exceptional" club speed. And how did he learn to do that? Not from lessons. Watson has been coached, at the University of Georgia, but is really self-taught. He learned, Diaz said, by hitting plastic balls around his back yard as a boy — "curving the ball, shaping shots," making it fly as he wished. "Psychiatrist Dr. Edward Hallowell is a leading expert on ADD. ... Hallowell suspects that some of the greatest minds in history — including Einstein, Edison, Shakepeare, Mozart — had the condition, and that it enhanced their creativity. ... The reason, says Hallowell, is that people with ADD live their everyday existence in a state of jagged disorder — including a general restlessness and inability to sustain concentration — and thus hunger for structure in life. When they find an enjoyable endeavor that provides structure, they often take to it with a passion that leads them to excel. Because they are so used to adapting to disorder, they develop a heightened ability to make connections, which when unleashed within a structure can lead to extraordinary insights, solutions and innovations." So, a combination of boyhood experimentation and a unique way of thinking about the problem he faced produced Sunday's magnificent shot. As Watson said afterward, "I've never had a dream go this far, so I can't really say it's a dream come true. ... I don't even know what happened on the back nine. ... Nervous on every shot, every putt. Went into a playoff. I got in these trees and hit a crazy shot that I saw in my head, and somehow I'm here talking to you with a green jacket on." Haven't seen the shot yet? There's a clip of it in on the Masters' website. Not all of the ball's flight was captured by the cameras however, as Real Clear Sports explains, because Augusta National Golf Club doesn't allow those shots from blimps or camera cranes that would give good views from up high. Much more from Robert's conversation with Diaz will be on today's All Things Considered. We'll add the as-broadcast version of the interview to the top of this post later. Note at 8 a.m. ET, April 10: Earlier, we pointed to an ABC News video that included a clip of Watson's shot. That clip is no longer at the location we pointed to, so we've edited the post to point to the Masters' website.